Fair Trade Décor, Coronado’s own window on the world, opened its doors one year ago. As the shop selling handmade products from around the globe reaches the one-year mark in Coronado, it also celebrates its seventh anniversary in business around San Diego County. Each item at Fair Trade Décor is truly one-of-a kind, formed from the variations in the natural materials used and the individual design of the artist from piece to piece. Owner Elizabeth Paganelli has an incredible eye for decorating and selecting products from Africa, Southeast Asia, India, the Caribbean, Central and South America and the United States. The quality, appeal and uniqueness of the products are compelling. Many are museum quality pieces, and all of them are made by economically disadvantaged artisans who are paid fairly and given a sustainable opportunity to support and care for their family. The unique stories of products and artisans are key to the Fair Trade Décor retail experience. Video of the artisans is prominently displayed in the store. Printed stories about the art and artisans are included with each purchase. Customers quickly realize that their purchases have a positive impact on the livelihood of the artisans. Some of the products can be seen at www.fairtradedecor.com. In late 2011, Coronado residents Elizabeth and Jude Paganelli, started the business with the help of their adult children and nephews, bringing sustainable and ethically sourced, handcrafted art from around the world to local farmers markets. 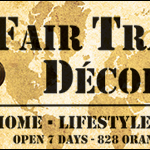 Fair Trade Décor became a member of the Fair Trade Federation, which provides the company and customers with an assurance that the products they purchase are made by artisans who are paid promptly and fairly. By spring of 2013, the Paganellis had opened the first dedicated Fair Trade retail store in the county on the Coast Highway in Del Mar. From there they have participated in numerous community events, supported local causes and hosted special events. Five years later, the family moved home and business to Coronado, when they subdivided the UPS store on Orange Avenue in the same building as the Village Theatre. Most recently, the store hosted the after party for a Coronado Film Festival classic film. 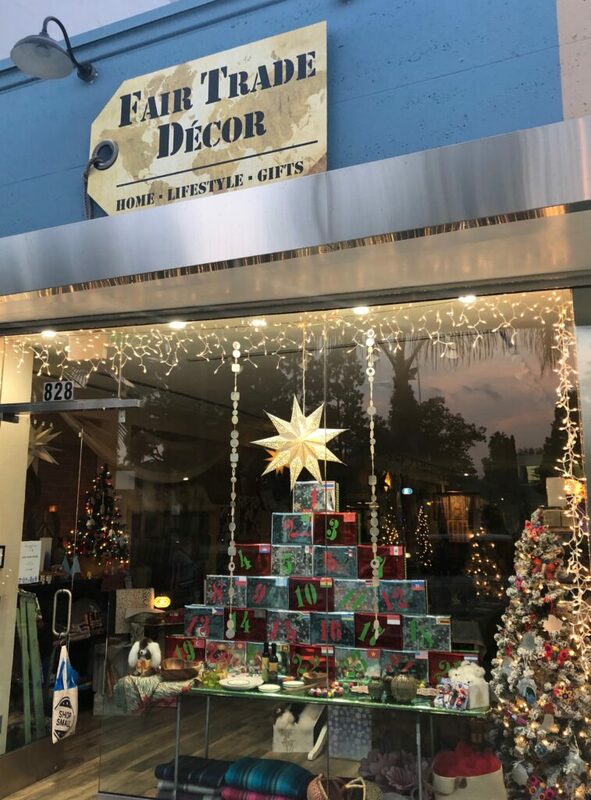 The Paganellis will host a private anniversary and holiday party at Fair Trade Décor this Friday, November 30, from 6:30-8:30pm. To attend, RSVP at the store or by calling (619) 675-0072. Entertainment will be provided by singer La Don Jones a regular performer in Coronado. Two San Diego area Fair Trade wholesale companies will be on hand for a trunk show and sale of their winter product lines. Lori Shuster, Founder of Shupaca, will be showing hand woven alpaca blankets and clothing from Ecuador, and Lucia Ruth, Brand Director of Malia Designs, will be showing their latest handbags made in Cambodia. Every purchase of Malia Designs helps prevent human trafficking. This event is an excellent opportunity to learn more from local women who are at the forefront of Fair Trade production and retail. The concept of Fair Trade, which is well known in Europe and the British commonwealth, may be best known in the U.S. for Fair Trade coffee and chocolate. In volatile markets for commodities, such as coffee beans, small farmers are often forced out of business and out of their homes by large price fluctuations. Companies that purchase Fair Trade coffee agree to always pay the greater of market rate or a minimum price that will sustain the growers. Fair Trade has gradually expanded to many areas of agriculture and handmade products. The primary international organization in this expansion was the World Fair Trade Organization, or WFTO. In the United States, the Fair Trade movement had its start in 1946 with the action of Edna Ruth Byler, a member of the Mennonite Church, who brought embroidery home from Puerto Rico to sell in her community. Her early work was the seed of what is now Ten Thousand Villages, the largest Fair Trade retailer in the U.S. and Canada. Ten Thousand Villages is also a founding member of the Fair Trade Federation, which was formed in 1994 to support U.S and Canadian businesses seeking to expand Fair Trade with producers around the world. The Federation is also an active member of the WFTO. Together, the two organizations promote a set of Fair Trade Principles that guide the actions and business practices of all members. In addition to economic opportunity and fair/prompt pay for artisans, principles of Fair Trade include sustainability, transparency, equality, safety, children’s rights, environmental protection and cultural respect. The Coronado Times provides in-depth coverage of Coronado, CA (92118). Our online publication includes local news, events, military, sports, business, entertainment, real estate, people and lifestyle. Share your story ideas or letters to the editor. © Copyright 2002-2019 eCoronado.com, LLC. All rights reserved. Crafted in Coronado, CA. Content may not be redistributed without permission.